Town captain Matty Brown has backed manager Billy Heath to turn around the club’s poor form. Town’s 4-0 defeat at Hartlepool on Tuesday means they have now gone the longest without a win since the Halifax manager was appointed, but Brown insists Heath is the right man for the job. “Every single player is behind Billy,” said the Town skipper. “We all want Billy to stay in charge because we know he can be successful. “The fans might have moans and groans but have a look at what he’s achieved - he got the club promoted and we’re competitive in this league. “The last game was the first time we’ve been taught a lesson this season. The other bad results have been down to our own mistakes. Brown missed Tuesday’s 4-0 defeat at Hartlepool through suspension but should return to the team tomorrow, and has issued a rallying call for the Town fans to show their support. “We overachieved with the start we had,” he said. “We are a massive club and the fans do demand success, and I don’t blame them for that. “But we would have taken where we are now in the league at this stage and I’d bite your hand off for it at the end of the season. “You just have to look at Tony Pulis getting sacked at West Brom. He’s done a great job there but because of that people want more. “Because we were up near the top of the table it makes our poor form now look even worse. “The pressure does mount up. I’m not saying the fans should be more realistic - I’ve been there as a fan myself and you always want more. “But we need to look at what we’re competing against and we’re a part-time team against a lot of big clubs. “I’m still sure we can have a positive season, we’ve got good players who can win games at the drop of a hat. “Matty Kosylo has been a big miss for us as he’s our main creative spark. We’re just going through a difficult spell, but we need the fans to stick together. 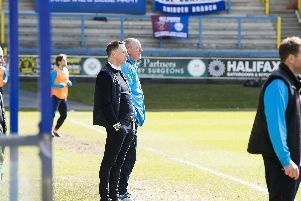 “I know there have been calls for players to be in or out of the team or what have you, but the whole team is behind the manager and we need the fans on our side too. Brown is convinced Town will get back on track after what he says has been an unacceptable run of form. “As a group we know the situation we’re in and we’re not hiding away from the fact that we’re on a disappointing run,” he said. “We need to break out of it as soon as we can and we’ve had discussions as a group about how we do that. “Things just haven’t happened for us for various reasons. “We know it will turn but the pressure mounts up the longer it goes on. “We’ve got to remain focused and get back to what we’re good at. “We’ve got two winnable home games coming up. “We’ve had people out of the team but we need to make sure we take maximum points and if we do, that changes the picture completely. “The run we’ve been on isn’t acceptable for a club of our size but these things happen.